The Five Galaxies are a tough neighborhood . . . and humanity is the new kid on the block. Of the thousands of races in a galaxy full of aliens, ours is the only one that claims to have evolved on its own, without genetic engineering by a Patron species. With its own new clients – genetically modified dolphins and chimpanzees – upstart humanity faces a jealous universe. The ancient Patron clans can't decide whether to enslave the races of Terra . . . or just wipe them out. This is the universe created by David Brin for his award-winning "Uplift" series. 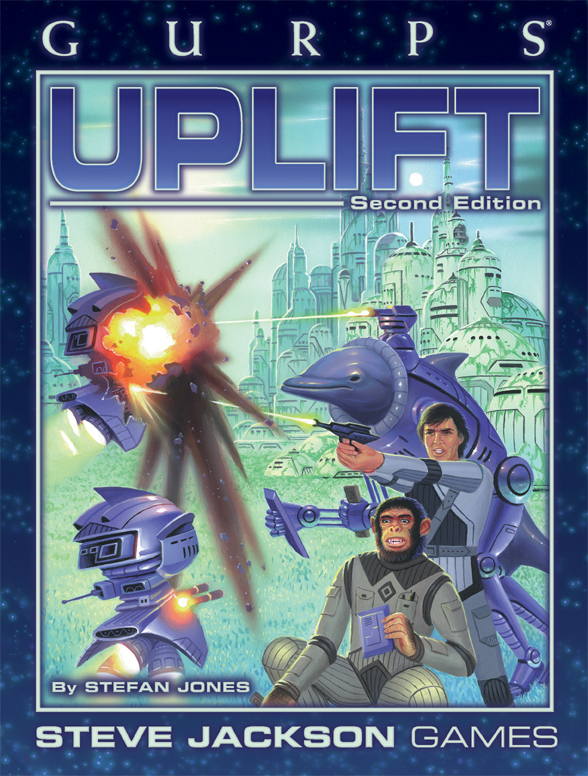 GURPS Uplift includes complete descriptions of the important alien races, maps and descriptions of the Terragens planets, and rules for creating – and Uplifting – new species. GURPS Uplift is intended for use with the GURPS Basic Set, GURPS Compendium I, and GURPS Space. It may be used as a sourcebook for any roleplaying system, or as background for fans of the "Uplift" series. Sundiver. Set in the early days of mankind's Uplift of its cousins. There's a mystery in the Sun, and the aliens don't seem to want us to solve it . . .
Startide Rising. A spaceship crewed by dolphins, with a few humans and one chimp, stumbles on a secret it doesn't understand, and has to outwit an alien armada. This award-winning novel is probably the best place to start the series. The Uplift War. The events of Startide Rising trigger an alien attack on a small Earth colony . . . leading to guerrilla war, with real gorillas. Brightness Reef. First book of a new "Uplift" trilogy, introducing the world of Jijo, where fugitive members of several races, including humanity, live together in peace. Then the Galaxy finds them . . .
Infinity's Shore. The consequences of Startide Rising touch Jijo, and so do some of the characters. Heaven's Reach. The trilogy concludes with events that literally shake the Galaxies. Contacting Aliens: An Illustrated Guide to David Brin's Uplift Universe. Illustrations and detailed descriptions of dozens of different aliens . . . the friends and foes of mankind. A great resource for your games! GURPS Blue Planet – Prepare for a compelling journey into humanity's future on a distant planet where life is hard and dying is easy. Stefan Jones' original designer article, written when the book was still in its first edition! Need miniatures? Check out Uplift Miniatures for 28mm figures of Earthclan's allies: Fen, Chim, and Tymbrini. 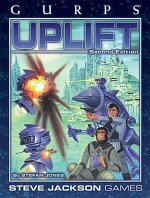 See what RPGnet is saying about GURPS Uplift.